It’s the most wonderful time of the year! My girlfriend Christine and I always vow to give back to our community we love by doing all of our holiday shopping with local businesses. We think it is only fair to support the shops who give back to the city where we live, work, and play. 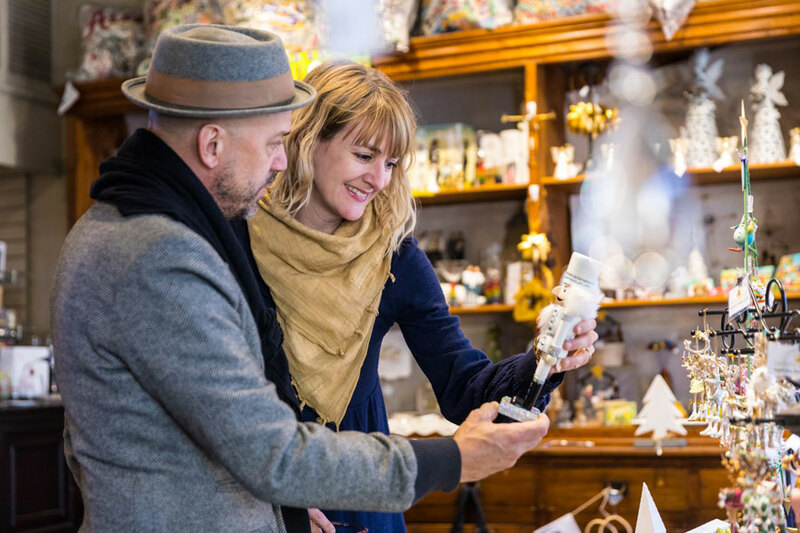 Our favorite wonderland is the French Quarter, so we always look forward to a shopping extravaganza there during the holidays. We shop ‘til we drop, stop for lunch, and shop some more. We always get started on our holiday list on a day that gets our festive spirits fired up, the day they light the French Market District tree adorned with fleur de lis. This year, we will start on November 30th so we can shop all day then take in the tree lighting and listen to Kermit Ruffins, inspired by Louis Armstrong, play his trumpet in a free concert! Afterwards, we will have dinner at Corner Oyster House Bar & Grill on Jackson Square where we traditionally relish seafood platters and raw oysters. If we have any room left, we stroll across the street to Café du Monde for café au lait and beignets, a French Market tradition since 1862. Last year, we started at the French Market’s diverse flea market with treasures from around the world. We found clothing, art, jewelry, crafts, spices, hot sauces, and souvenirs for everyone on our list. It offers a local experience with a bustling market full of carefully selected handmade artisan food, arts, and crafts. From food to local wearable art, the market is full of locals catering to locals and tourists alike and is a market of diversity and one of our favorite places to shop. We strolled down Decatur Street and sampled creamy Creole pralines at Aunt Sally’s Praline Shop, Southern Candymakers, and at Evans Creole Candy Factory and debated the merits of each. Mmm, they are all so delicious! Our favorite one stop shop was Dutch Alley Artist’s Co-Op which features the original works of 25 regional artists. We enjoyed talking to many of the artists about their craft and purchased several items for our homes there. Outside the door, the calliope on the Steamboat Natchez rang out “Jingle Bells” after the red streetcar rattled down the tracks. We wandered along Decatur Street to explore uncharted territory. We popped into Pop City to browse the locally produced clothing, art, books, and housewares. Next, we dove into N’awlins Sports for some Saints gifts for our favorite “Who Dats.” Finally, we indulged our grandchildren in The Little Toy Shop filled with high quality toys and collectable dolls. Santa will be bringing some special gifts this year that will be treasured for many generations. 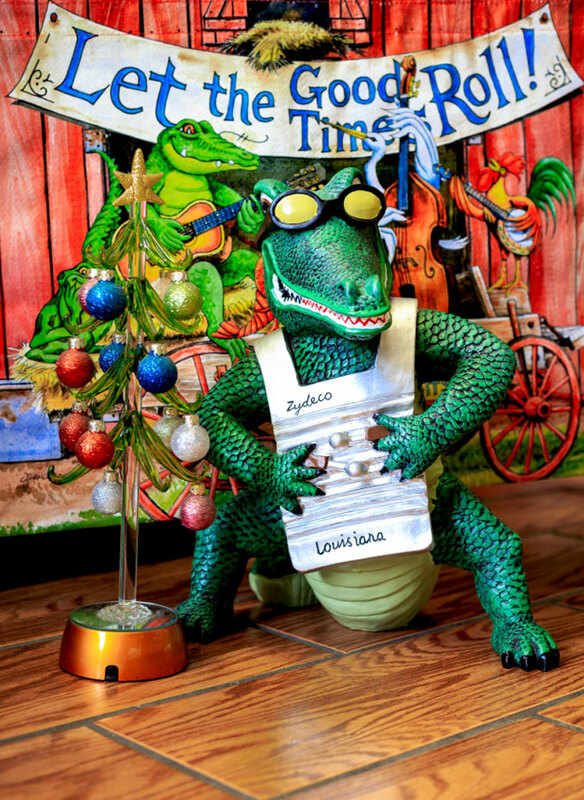 Speaking of which, we looked like delighted elves when we found Merry Christmas & All That Jazz with a wide variety of ornaments and gifts found in New Orleans. Our trees will be spectacular this year! Baby One had beautiful clothing for our littlest grandchildren and at What’s New, we found fleur de lis platters and other local serving ware. We browsed wonderful fine art at Galerie Cayenne, bought a tie and a beautiful hand-painted nightgown for my grand-daughter at Head to Toe, and found one last gift for my hubby at Voodoo Harley Davidson and made our final check on our holiday shopping list. We strolled up the ramp by the café to the elevated plaza known as Washington Artillery Park for the amazing view of the muddy Mississippi River, Jackson Square, and St. Louis Cathedral. A lone sax player entertained on the Moonwalk promenade below. We felt the cool breeze and watched the Steamboat Natchez plow through the busy waterway. We felt grateful to live in a diverse and historically rich city and vowed to return to our favorite bend in the majestic Mississippi River which cradles the French Quarter again soon.